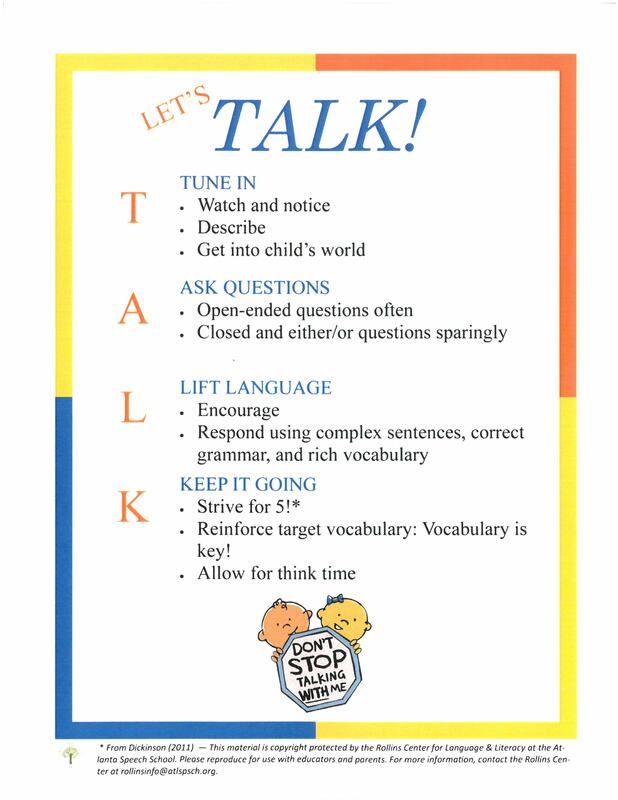 Conversational Partnership involves having meaningful conversations WITH (not to or at) your child, engaging them as a partner in the effort, rather than a one-way street of requests and/or narration. Tier 1 words are those children are likely to be exposed to throughout their everyday experiences. These are generally simple words like dog, tree, ball, play, and talk. Tier 2 words are more rich and complex. For example, words like curious, elated, exclaimed, and furious. When adults model these words for children, it helps build critical language knowledge. Discussion: We discussed times of day that parents might engage their child(ren) as a conversational/communication partner (to include words, facial expressions, gestures, eye contact, parentese, open-ended questions and touch). Examples included bedtime, mealtime, travel time, and bath time. We also brainstormed possible tiers of vocabulary associated with these times of day. Partner Practice: Parents paired up to practice conversations using tiers of vocabulary and open-ended questions. Homework: Engage in conversational/communication exchanges with children using the strategies in the session recap. Also, continue to work on vision board goals. Next Post: See You In The Fall!